This salad is open to interpretation; feel free to swap the greens, berries,veggies,and seeds to your preference. Serve at room temperature or cold, as a light lunch or alongside your favourite dinner dishes. Put the water in a small saucepan. Bring it to a boil, then add the quinoa. Reduce heat, cover and let simmer for about 13 to 16 minutes until the water is absorbed. Remove from heat, and remove the lid. Fluff with a fork and let cool. 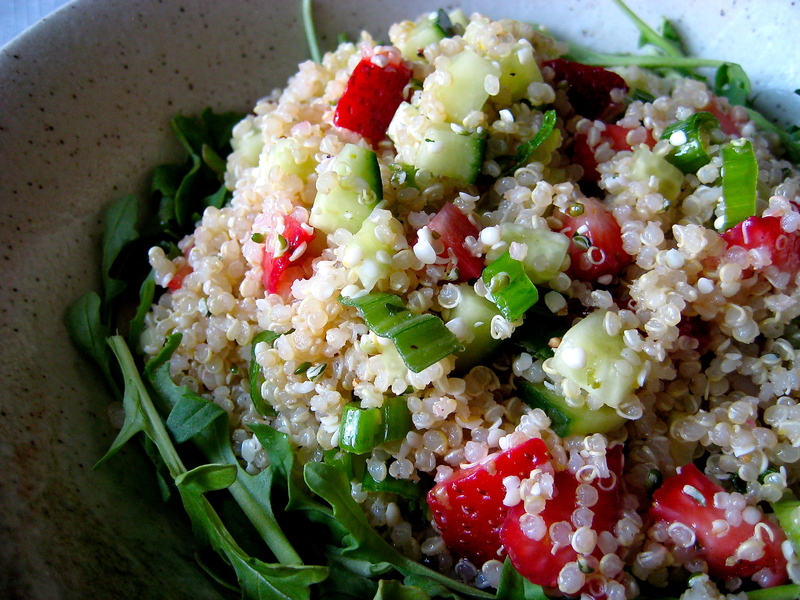 Put the quinoa in a bowl with the strawberries, cucumber, hemp seeds, and green onion. Toss to mix. To make the dressing, put the olive oil, vinegar, maple syrup, minced garlic, lemon zest, and a sprinkle of salt and pepper in a small bowl. Whisk to combine. Pour the dressing over the quinoa mixture. Stir to mix, adjusting salt and pepper to taste. Serve over arugula.